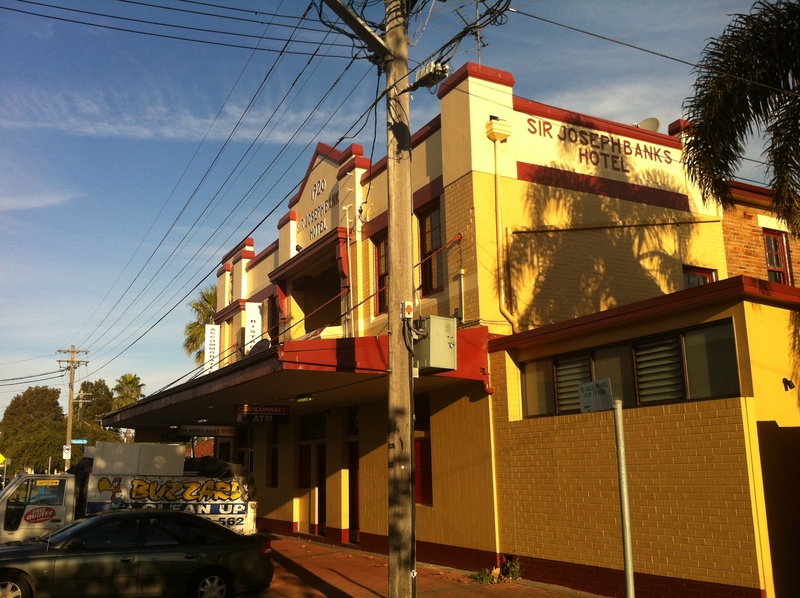 The Sir Joseph Banks Hotel, Botany Road. While spending time in Botany yesterday, I walked past the Sir Joseph Banks Hotel on Botany Road, turned down Waratah Road, and found myself staring at…the Sir Joseph Banks Hotel? What?! The Sir Joseph Banks Hotel, Anniversary Street. This bigger hotel stood in front of a large park, so I’ll fill you in as we explore the park. 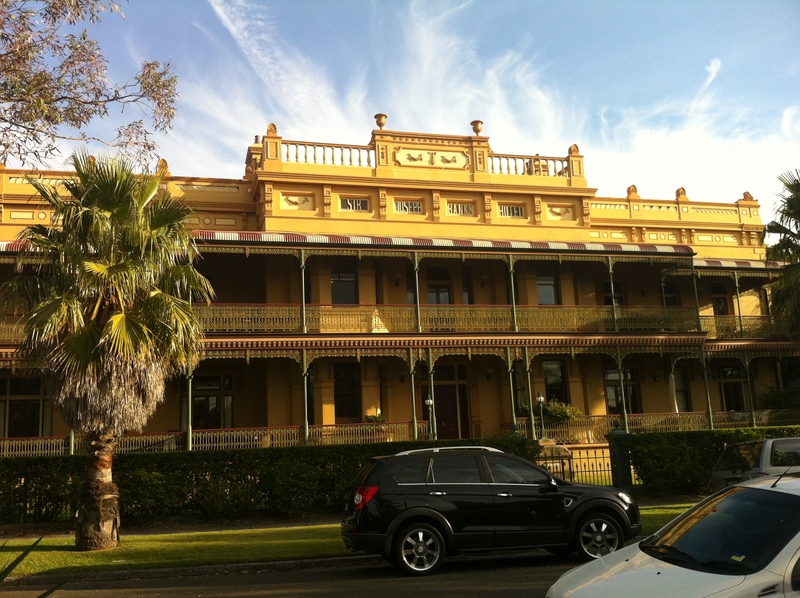 It turned out that this hotel was the original Sir Joseph Banks Hotel, built in 1844. 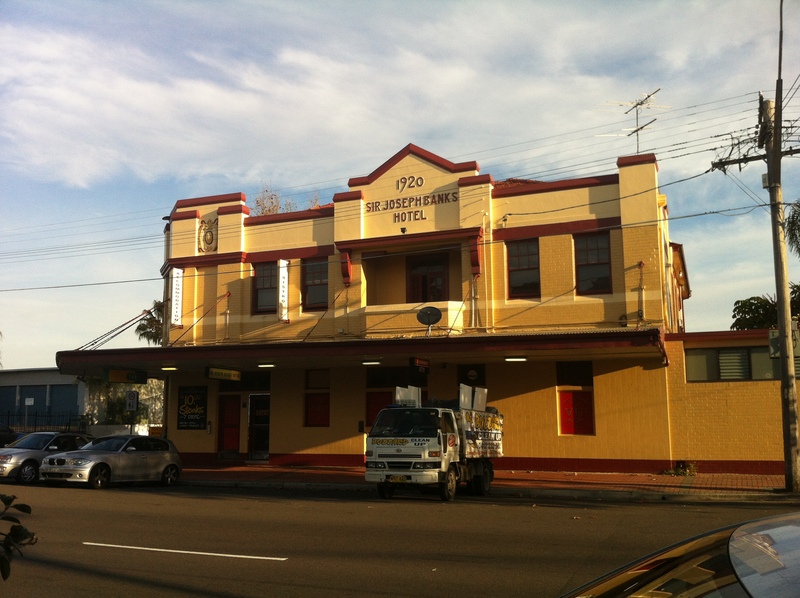 In 1920, the second Sir Joe was built on Botany Road, and the pub license was transferred to it, leaving the original free to become private units, which is how it is today. 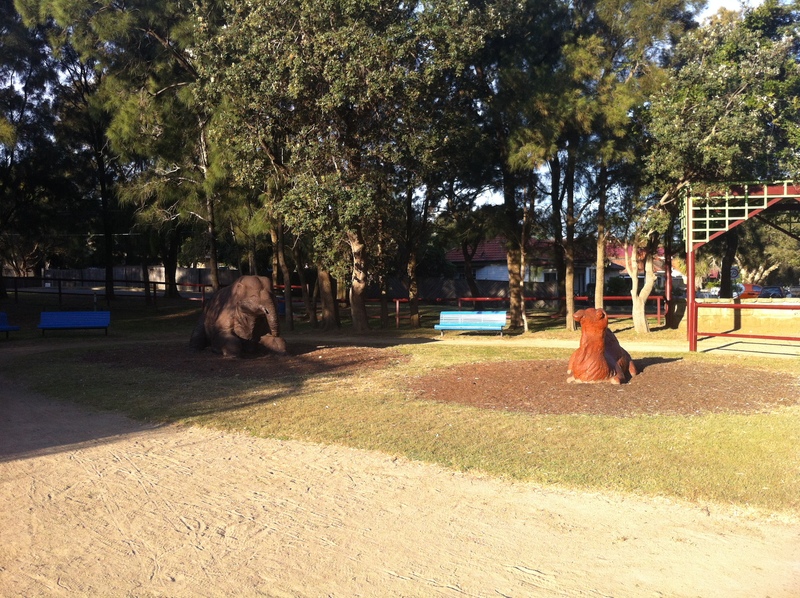 Running track, Sir Joseph Banks Pleasure Gardens. That’s the dull part out of the way. 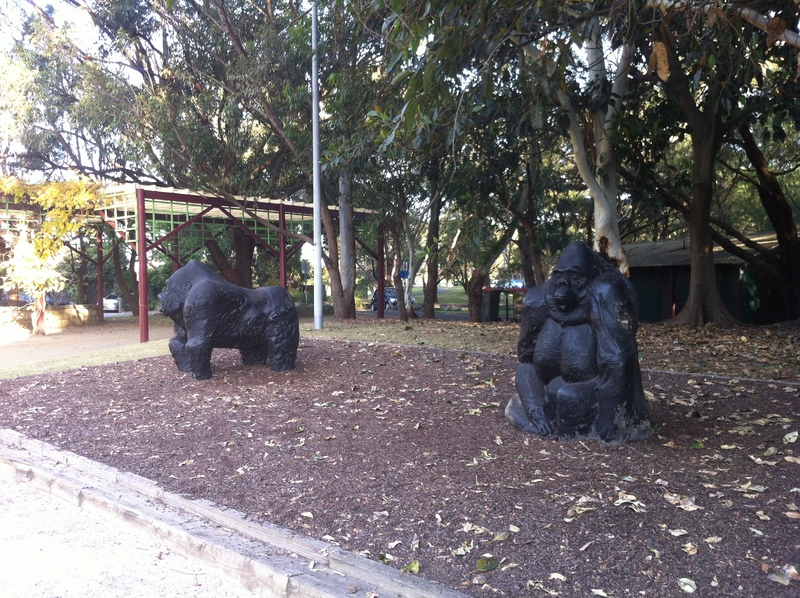 The interesting part of this place is the garden, which has provided Sydney with a few major firsts since 1850. Here, at the garden’s running track, foot racing events were *yawn* held throughout the 1880s during the… professional running boom…I know, I know. We’ll get there. 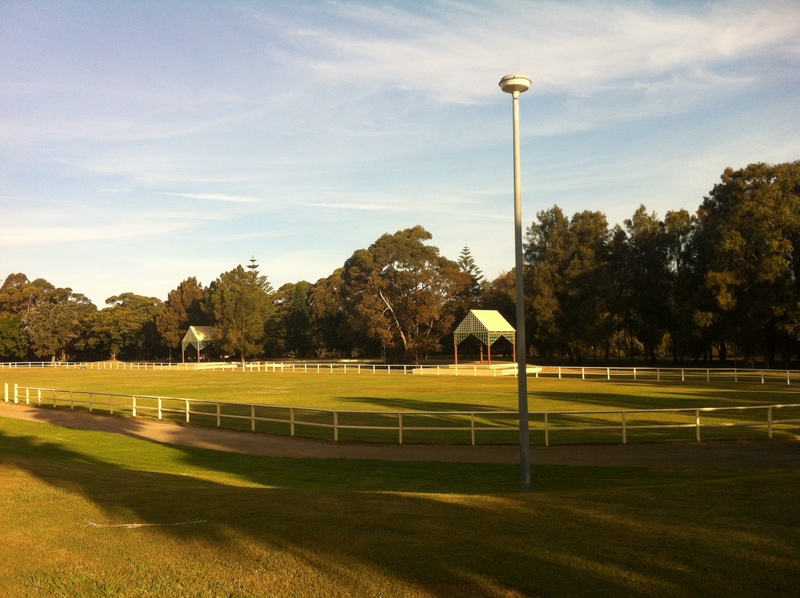 Also held at this running track was Australia’s first game of representative rugby league, in which the South Sydney Probables clashed with the Possibles. I’m guessing the Likelies played against the Maybes the week after. 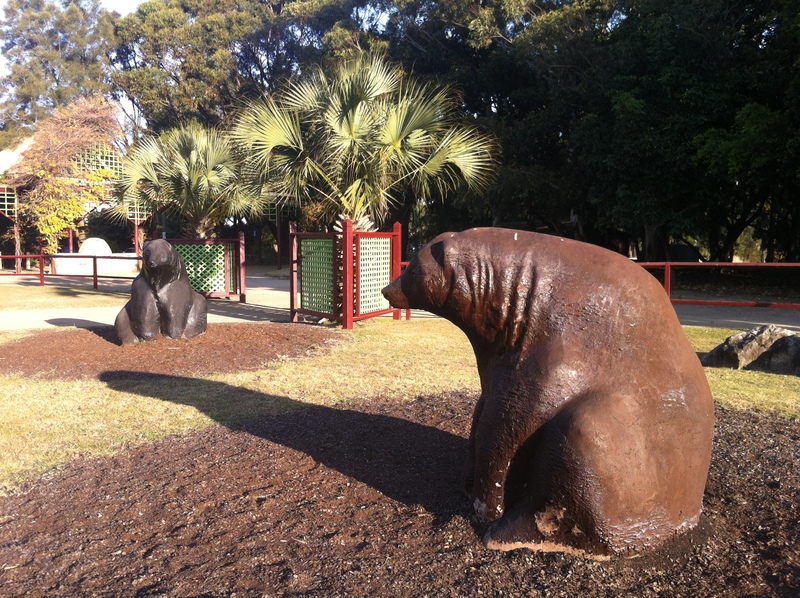 Okay, now, the most interesting thing about this park is that it was home to Australia’s first zoo. The site’s owner at the time, a timber merchant named William Beaumont, improved the hotel and created the ‘Pleasure Gardens’, which is a more scandalous and giggle-inducing name today than it would have been back then. 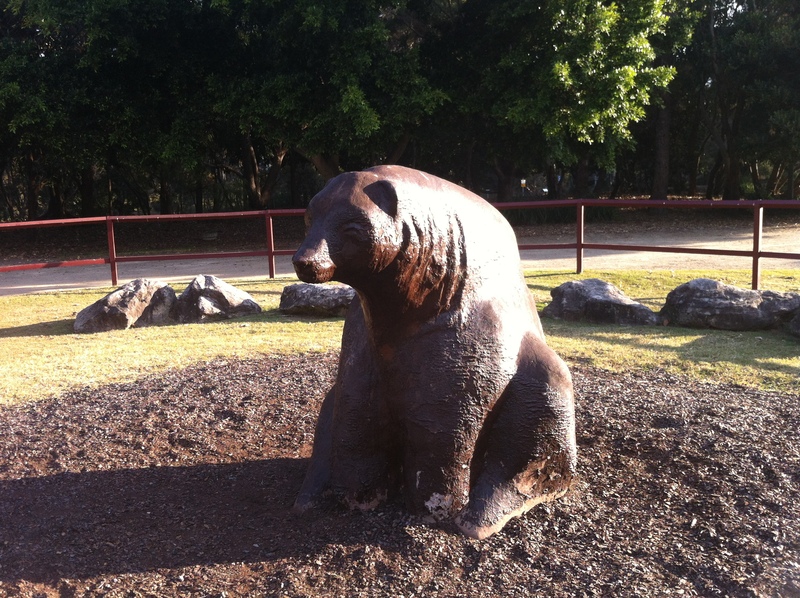 The gardens included the private zoo. Bell’s Life in Sydney and Sporting Reviewer, Sat 27 Sep, 1856. 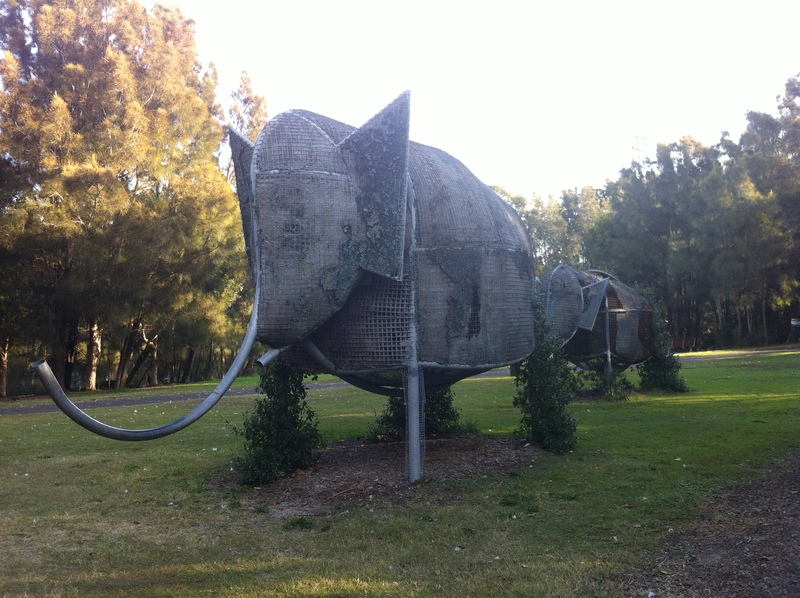 It’s hard to imagine tigers and elephants wandering around the grounds these days, so to assist you, the City of Botany Bay has erected a series of life size animal statues. In a way it helps, but in another way it’s kind of creepy. Judge for yourself. 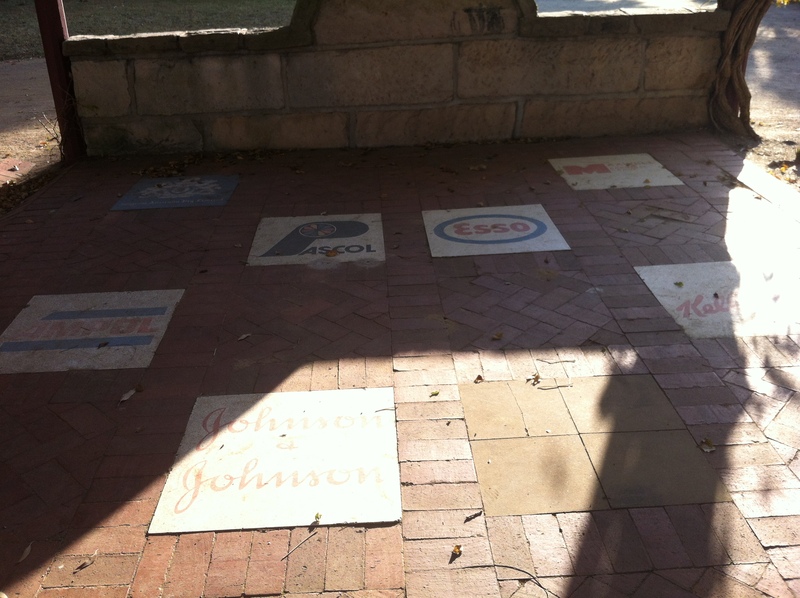 The park was entirely restored and upgraded for the Bicentenary in 1988, and the effort’s corporate sponsors were immortalised in concrete at the east end of the park. It’s interesting to note just how few of these brand names are widely visible today. Ampol and Esso were both absorbed by their parent companies, proving once again that no one is safe from the Big Oil Killuminati. Maxwell Chemical Corporation, which is just the kind of name you want to see emblazoned on your pleasure garden, has moved offshore. Seagram seems to have disappeared from the corporate environment in New South Wales, at least. Even Pascol Paints has been absorbed by Wattyl, going against all advice you were ever given about mixing paints. The most striking thing about this place is how secluded it feels. It’s off the main road, but the whole suburb of Botany feels a world away from Sydney as it is. I suppose in that regard, it was the perfect environment for a zoo. The most important feature of the garden today are the series of ponds that form protected wetlands. The whole park sits on land reclaimed from Botany Bay, so some attempt at looking after the marine life there is better than none at all. Meanwhile, up at the Sir Joseph Banks Hotel Pub Edition, you’d never know any of it was there. Here, they just sit, and drink, and smoke, and bet, and watch the millionth game of rugby league played since the days of probability vs possibility. 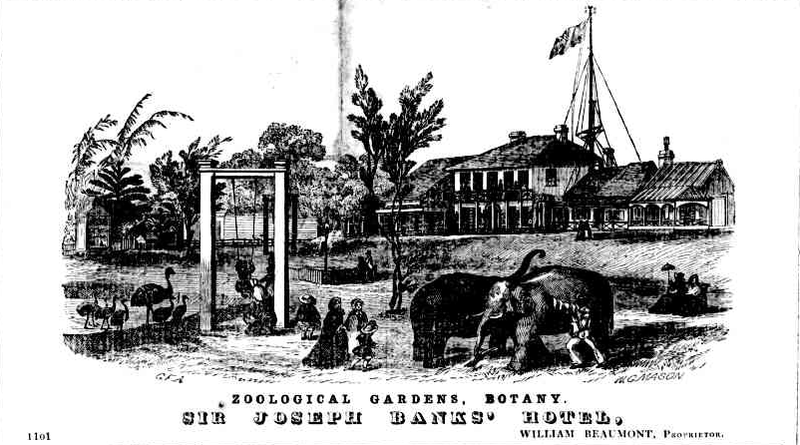 I think about it this way: the goings-on of the Sir Joseph Banks Pub on Botany Road are indicative of all that’s probable, but the Victorian wonderland and colourful history of the Sir Joseph Banks Hotel and Pleasure Gardens are all about what’s possible. Thanks Michael for going to the trouble to write such a fun article on Botany and my Great Great Grandfather, William Beaumont. The original hotel is directly behind the Anniversary St building and faces the Park with the “Zoo Animals”. It’s much smaller that the one built in about the 1880s. When did you live there? My grandmother returned to Sydney leaving grandad in Glen Innes, and lived with her four children at the old Sir Joseph Banks in about 1920-ish, which fits with the article above about the change into flats.. I’ve had a photo of my dad aged about 12 with his cricket bat standing in front of the lovely wrought iron railings on the front verandah, and until my recent research, I had been unable to identify the place. It’s great that it is still there and being preserved. Does anyone know if there are old records about the tenants? I was given just today ‘The History of Botany’ which was reprinted for the Captain Cook Bi-centenary in 1970, from the original 1938 book about Botany. What a treasure! i also have just found info that my father lived and died at the joseph banks hotel in feb 1999 .would appreciate any info on how long he lived there and the cercmstances in which he died. david bennett tamworth .his name was Ross Bennett. I am sorry I am unable to provide any of the names of the tenants of the second Sir Joseph Banks Hotel. The second Sir Joseph Banks Hotel was built by Frank Smith after my GG grandfather William Beaumont and his partner James Waller (who in 1851 became his brother-in-law, after his first wife had died) had moved on. Thanks, Peter. It was a long shot anyway. Who can say what happens to such records? On another matter, I have been searching for the records of the Prince Henry Hospital where some of our Clingan family were treated/died/worked, but when the post of matron was abolished (relatively recently) and given to a (non – nursing) Manager, he destroyed them all. I am not sure just where in Botany the rest of the Clingan family lived. As for holding a genuine Turner, I think that lady was having you all on! I have never come across any painting by Turner of a cat and fish (however, that’s not to say one doesn’t exist!) But.. you never know!!!! It might have been a copy. Art students used to have to copy old masters to show that they had a proper technique. Jack Johnson the American boxer lived at the hotel with his (white) wife in 1908. Jack was the first black heavyweight world champion, he won the title from Tommy Burns on Boxing Day 1908. Burns was from Canada, the site where the fight took place would latter become know as Sydney stadium . 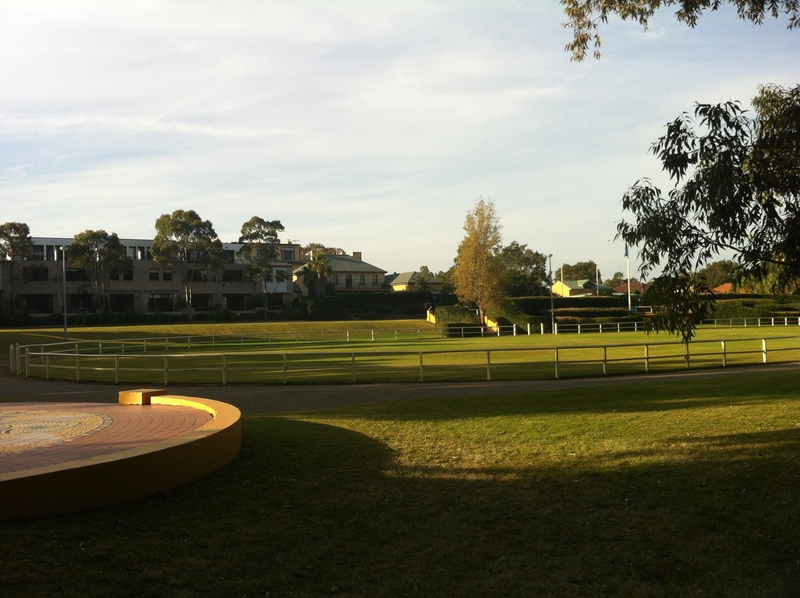 Johnson had a ring set up and trained for the fight in the grounds of the hotel. I came across this site, researching the steam locomotive that operated in the pleasure grounds there in the 1880’s. It ran on 2′ or 2′-6″ gauge track with up to 3 trailers behind. Built by Wearne of Sydney and appears to be based on a Sydney steam tram of 0-4-2 wheel arrangement with inverted saddle tank. There’s a small article with photographs of it in the August 1970 edition of “Trolley Wire” . Interesting story. I wonder also, what happened to Amoco, another petrol company that operates in the 60’s and 70’s.